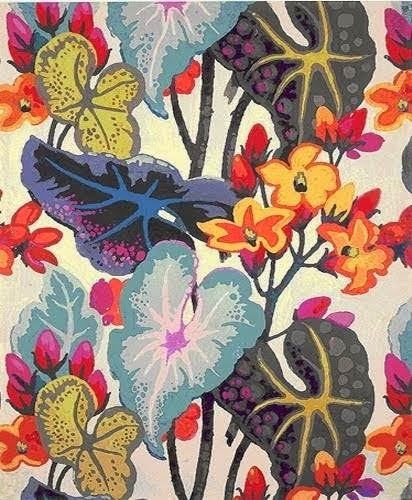 Textile Design for Cretonne, 1928? One of my favorite challenges every month is put on by Art Bead Scene. Every month they choose a picture to inspire a new piece of jewelry which has to contain art beads. I just love the picture that was put up for inspiration this month. All the colors, both warm and cold, as well as the different shapes just drew me in. I had a lot of trouble trying to decide just what to focus on. Once I sat down and thought about however it became clear what I kept focusing on was the black and blue leaf. The shape really reminded me of a heart. Once that was determined, the rest was easy. The focal is by StudioJuls and has those wonderful black, blue and purple tones that I was drawn too. I attempted to draw those colors out more by using kyanite and amethyst beads. I then tied it all together using gunmetal chain and silver-filled wire. Art Bead Scene Inspires me Again! Lovely necklace. And what a playful tassel.